It’s official: pumpkin everything is back. And that can only mean one thing: it’s time to pull out those chunky knits, boots, and tights because, folks, it is officially fall. To update your style this autumn, look no further than some of the season’s hottest trends that graced the runways during Fall Fashion Week. 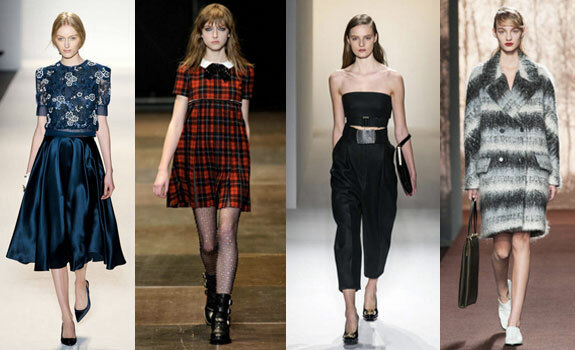 Not sure which Fall 2013 trend is right for you? Just take the quiz below to find out! Once you get your answer, find your letter and corresponding result below for a sample outfit based on your personality type. In my opinion, there is no shape more classically feminine than a full skirt. Play up this iconic silhouette with a floral patterned blouse worn under a polka dot sweater — make sure to let the collar peep up above the neckline! 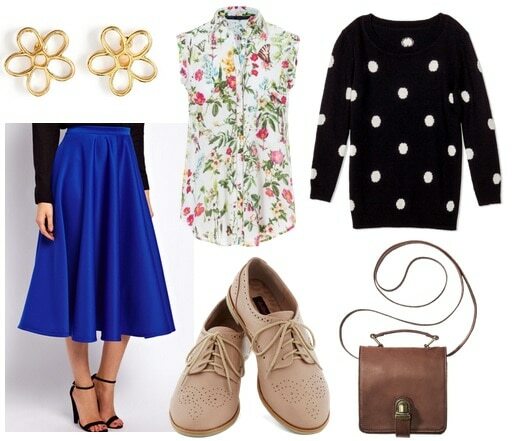 Finish the look with dainty flower studs, neutral brogues, and mini cross-body to carry your simplest essentials. 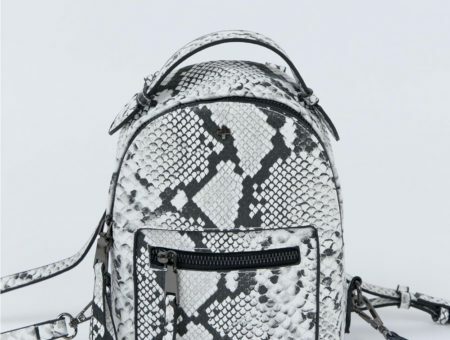 With ’90s fashion back in full force, it should not be surprising that the print of choice for the grunge revolution is here again. Yep, plaid is back in a major way for fall. While the red and black check is iconic, I loved the look of this black and white number worn under a cropped turtleneck sweater. (Note: turtlenecks are also huge for fall!) Pair the look with subtle detailed tights, suede combat boots, and a hat. Slouchy pants are perfect for the girl who is no-fuss and this velvet pair is especially cool for fall. Because the pants are loose-fitting, pair them with a fitted top like this cropped lace one. Throw on a boho-chic vest, some patent loafers, and delicate gold accessories to complete the ensemble. 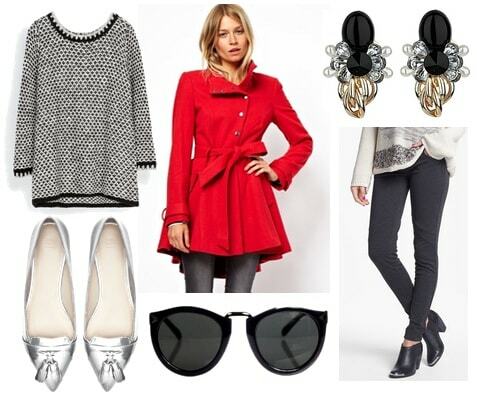 This last look features fall’s statement coat. What’s great about this trend is that it’s an easy yet statement-making addition to any outfit. And the best part? You can wear it time and time again. The bright red color, a-line detail, and asymmetrical collar will certainly make you stand apart. Complete the look with basic leggings, an oversized sweater, and trendy touches like these metallic loafers, rounded shades, and drop earrings. What Fall 2013 trend are you excited to try? Which of these outfits is your favorite? Did you like the quiz? Do you think your answer matches your personality? Please let us know what you think by leaving a comment below! 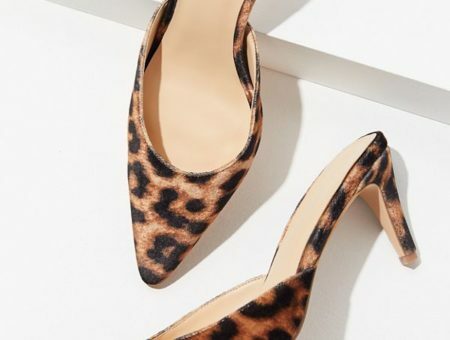 Next Would You Wear… Curved Heel Pumps?